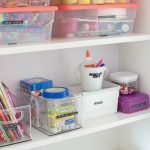 About two years ago I gave my pantry a “makeover” – I thought by putting baskets on the wire shelves that it would help corral like items and my small pantry would magically be organized and stay that way. What a falsehood. It stayed that way for a little while. Then, we would bring home groceries and just toss things anywhere we could find a spot. The girls would just throw their snacks in any basket and it would take eons to find things. The frustration was real and I knew I needed a better solution than just more baskets and containers. 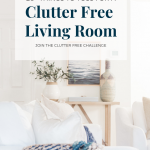 When we decided to do the Clutter Free Challenge (read more about that here), I knew the pantry would have to be a part of it. We had to try organizing our small pantry again and in a way that would stick. Our pantry is very small, just about 16 inches deep and maybe two feet wide. Small. It used to look like this before we made it over the first time. Horrifically embarrassing and an absolute mess. We could never find anything. I’ll still never know why home builders decide on this wire shelving. It’s the worst. After “organizing” it a couple years ago, it looked like this. You can see we added some storage solutions. A shelf to give us some more space for cans, containers for baking supplies, a few baskets at the bottom held miscellaneous items, and the wooden bins were meant to corral like items such as pasta, snacks, and baking items. It definitely was better, it was cleaned up – like items were put together, we could find things but it was far from organized. I can say that now because it didn’t stick. Everything didn’t really have a home. If I bought too much pasta, the pasta bin was overflowing. Those wooden bins ended up acting like a black hole and things would easily get lost. I couldn’t “shop” the pantry before grocery shopping because I couldn’t see everything easily. See what I mean? This absolutely drove me batty. The entire pantry felt like a dark scary place where we just shoved food anywhere it might fit. I first surveyed the needs of our family. 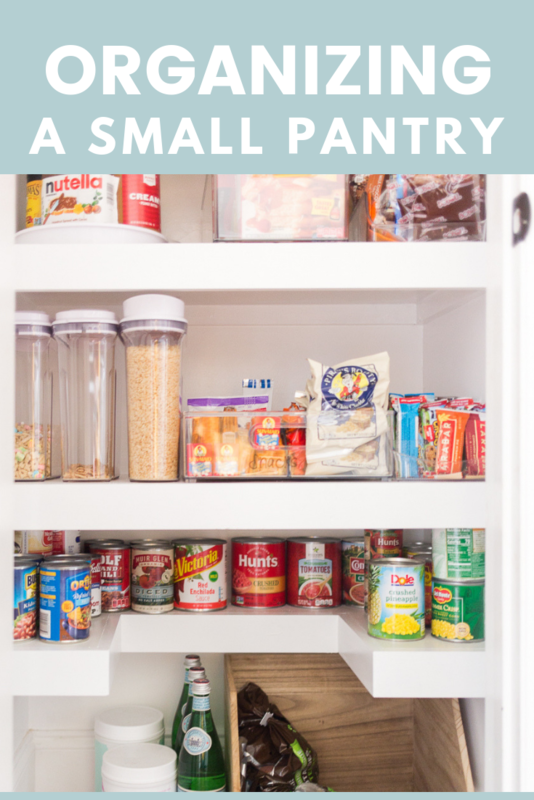 This tiny pantry was not enough space for us. It needed to be bigger. Without ripping the whole thing out and expanding it what could we do? I wanted the shelving a the bottom to have more height so I could put cereal on the bottom shelf so the children could access it more easily. The bins were not working. How could we corral like items and allow them to be seen enough of hidden in the bins? The cans were two and three cans deep. How could we store the canned goods so we could see all of them at once? 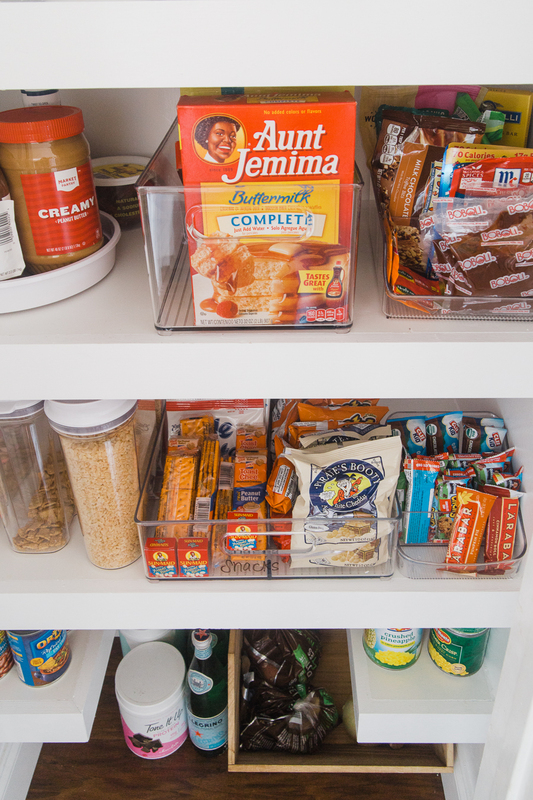 As I began planning our pantry organization – I really tried to answer the needs above. 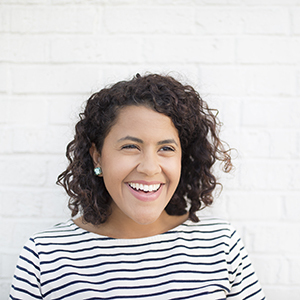 By doing that, my hope was that our pantry wouldn’t just be cleaned up – it would be functional and sustainable. We could keep it look neat and we’d be able to find things easily. So, the first thing we did was rip out the wire shelving. We should have done it years ago. Matt built faux floating shelves that remarkably make the space look bigger and brighter All on their own. He made the shelves deeper than the old wire shelves so we gained four inches in shelf space just by swapping the shelving. He also spread the shelving out a little more and we ended up with an additional modified shelf at the bottom of the pantry for our canned goods. I stayed with my method of corraling like items but I did it in a more sustainable way utilizing smaller clear bins, turntables, and trays. I invested in about a dozen clear seal tight containers to store pasta, cereal, rice, and other items. In the past, I avoided this because of the cost but I find they are much easier to stack and store than odd shaped packaging food normally comes in. 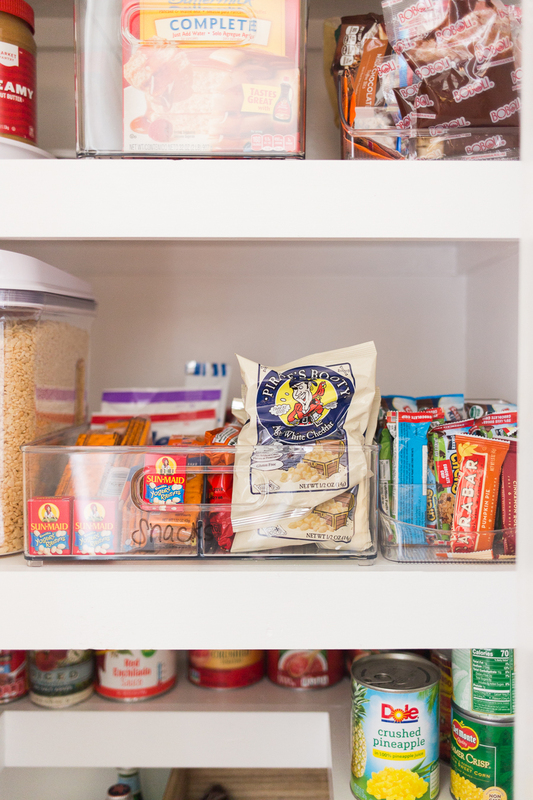 In a small pantry, every little bit of space counts. We did get our cereal to a lower shelf and that’s already paid dividends because my six-year-old can now dole out breakfast on mornings we are running late. Instead of a deep bin for snacks to never been seen again, I opted for a clear, wide, and shallow tray that could easily fit a week’s worth of snacks. I added an additional tray to store snack bars because everyone in my family likes a different type. Miscellaneous items like boxes of pancakes and bags of chocolate chips landed in clear containers like these and these. I opted not to add new labels to the clear containers and trays because I want to easily be able to rotate out items. Instead, I used a dry erase marker to scroll out the contents of each container. My favorite features of the newly organized pantry is the turntables. We got two. One large, 14″ turntable that stores all of our sauces/cooking liquids. The other is a 9″ one, that has things that are used more regularly like peanut butter, Nutella (Millie’s elixir of life), and honey. I also got this clear caddy for baking supplies like cupcake liners, food coloring gels, sprinkles etc. 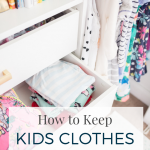 All of these items were once stored in that deep bin labeled “baking supplies” – these items always got lost in that bin and on more than one occasion, I purchased double or triple of items that we already had but simply could not find. This caddy can easily be brought out and put away. The bonus shelf at the bottom was modified so we could see all of our canned goods easily. Matt built the shelf with the middle section cut out so that no cans could get lost in the depth of the shelf. This also made it so we could see the items below more easily as well. I did opt to keep one of the wooden bins for produce that requires a cool dark space like potatoes. Answer the needs of your family. Do you need items lower? How often do you shop? 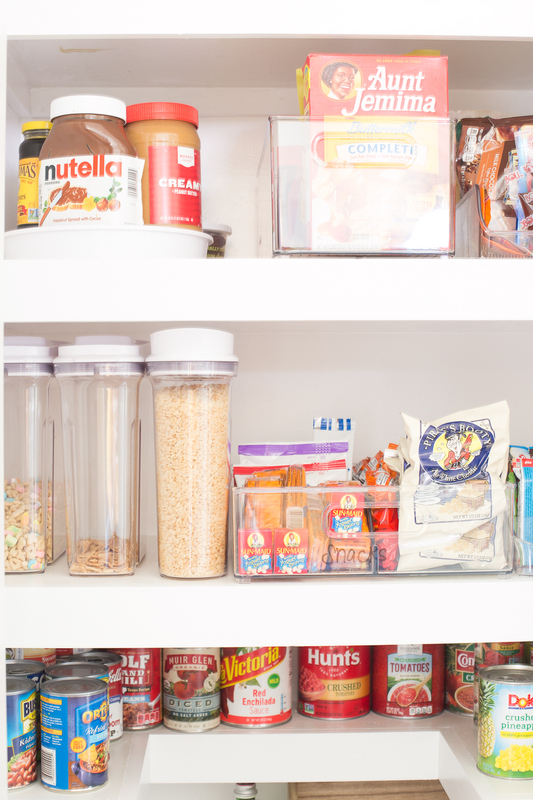 Do you store more than a week’s worth of snack items? How often do you bake? Invest in good food storage. I put this off longer than I should have. 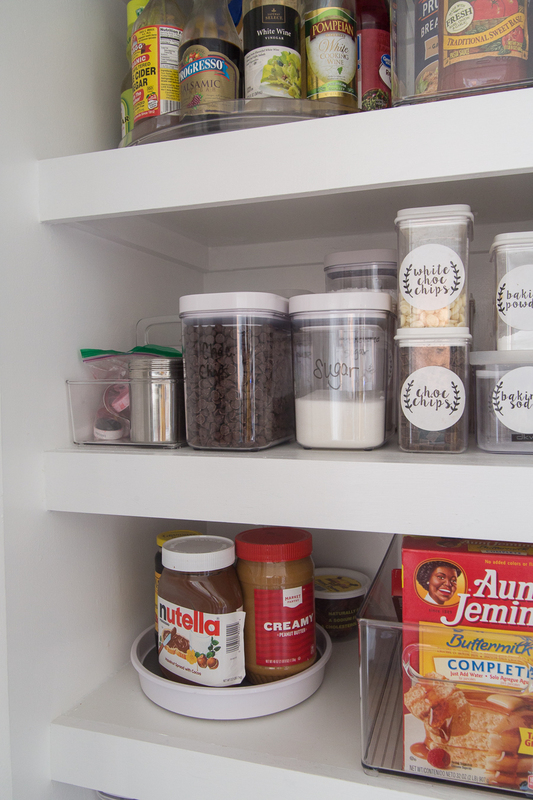 Having good stackable containers makes the world of difference when it comes to organizing your pantry. You can see all the items I used at the bottom of this post. I hope that’s helpful to you. Corral like items. You can see in this post that there’s a way that this system can work and a way that it just won’t. 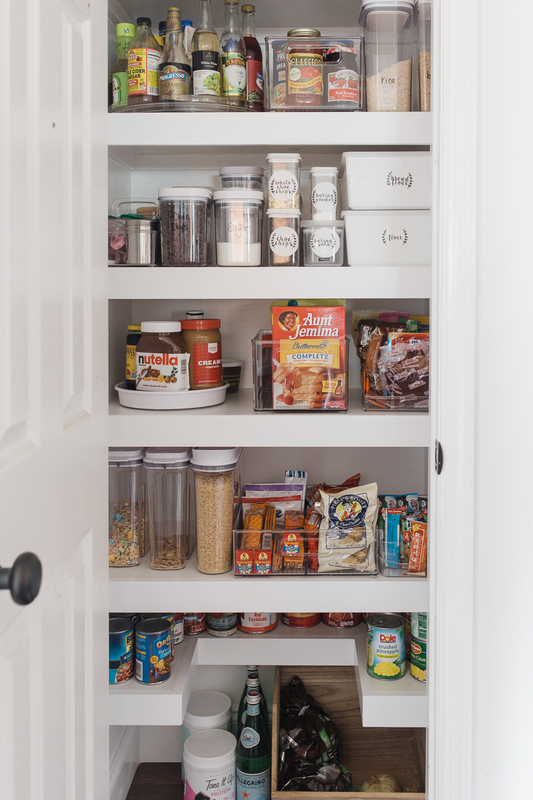 Corraling like items in a visible and easily accessible way is the most sustainable way to maintain an organized pantry. Consider using turntables, shallow trays, and clear storage containers. Don’t be afraid to make changes. 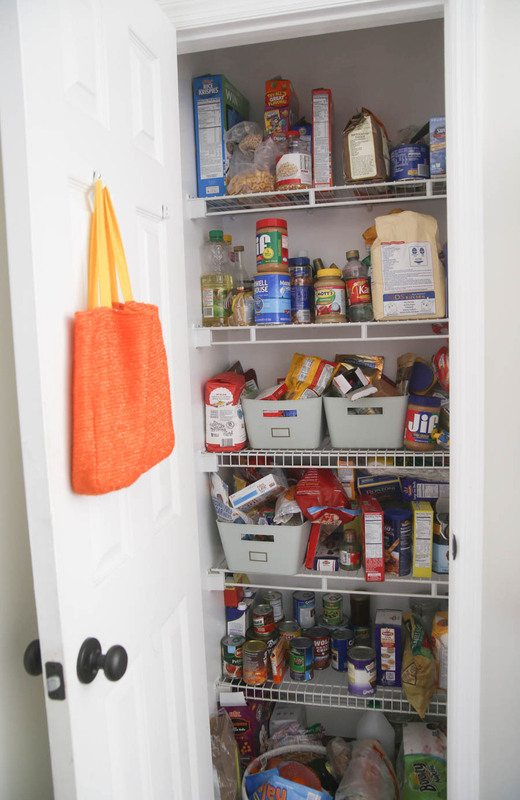 If the current condition of your pantry is not working for your needs, don’t be afraid to change it. 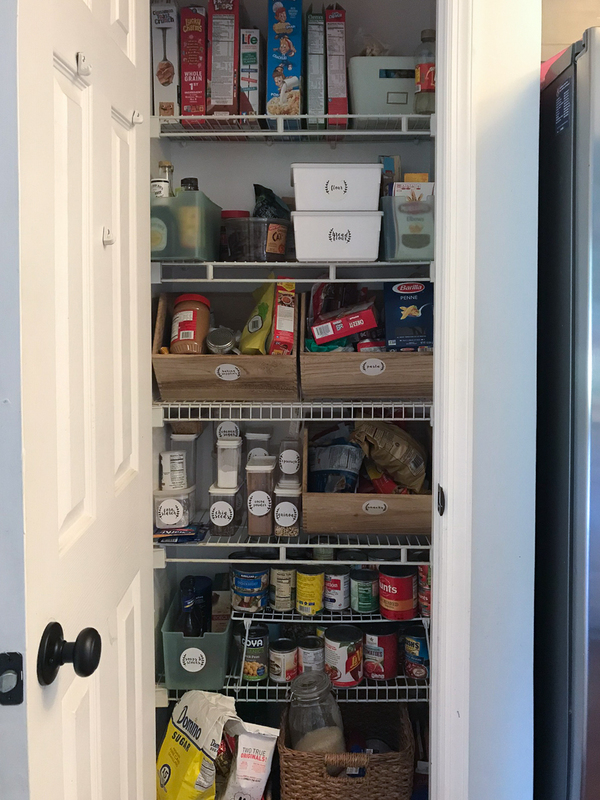 Replacing our shelving was the best thing we could have done to jumpstart the reorganization of our pantry. 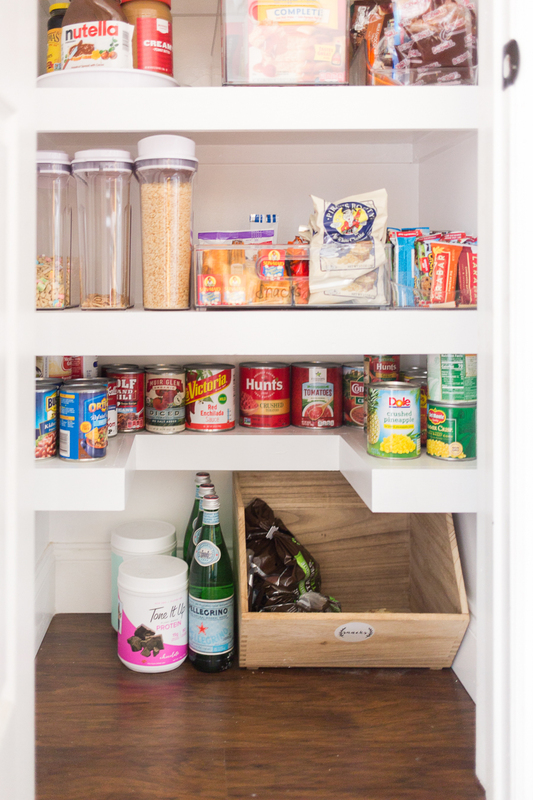 We were able to make our pantry feel larger and brighter while also actually giving ourselves extra space. 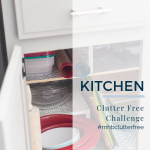 If you are working through your kitchen this week on the Clutter Free Challenge, I would love to hear what efforts you are making. Have you decluttered the 25+ for a more organized kitchen? 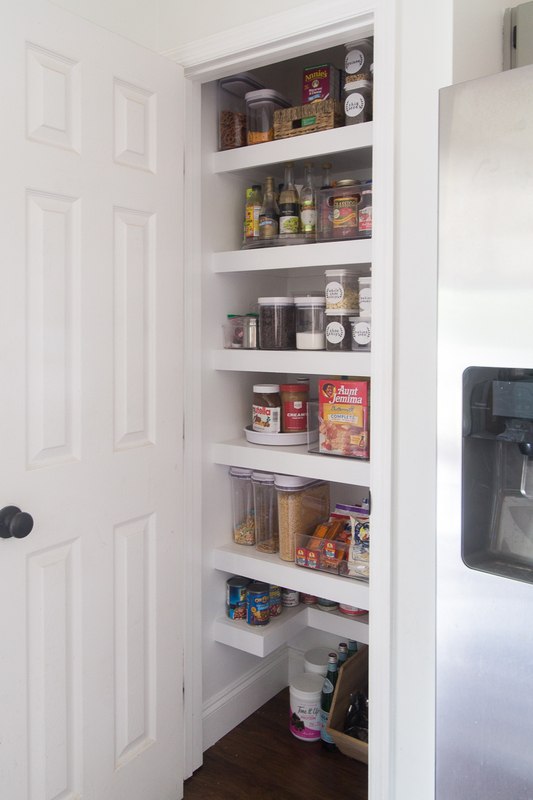 Or maybe you’re considering a pantry makeover. 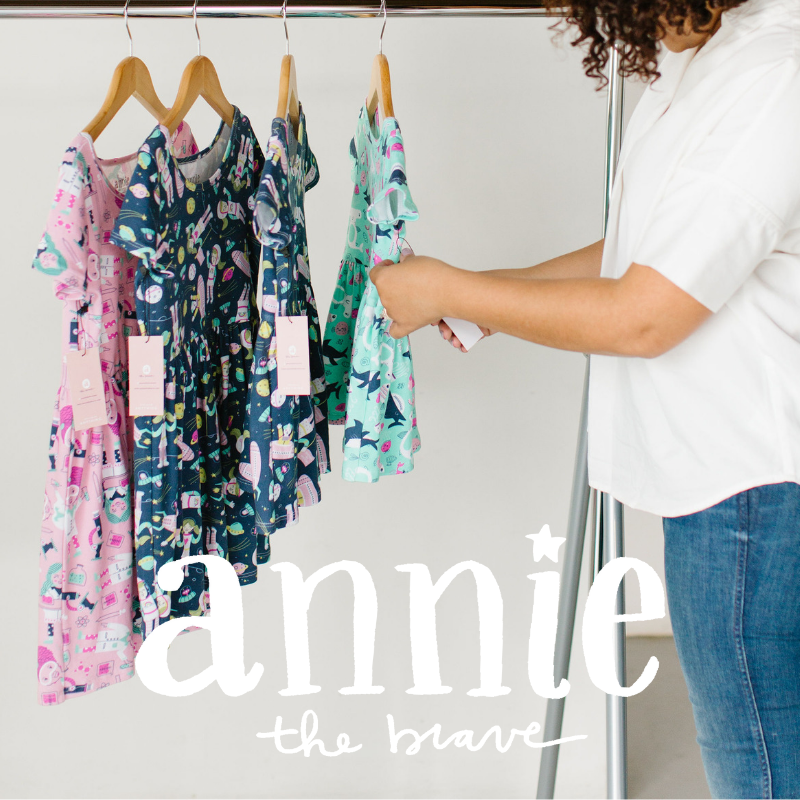 Whatever you are working on this week – you can do it! Let me know in the comments how it’s going. This looks amazing. I love the new shelves and how you’ve organized it. 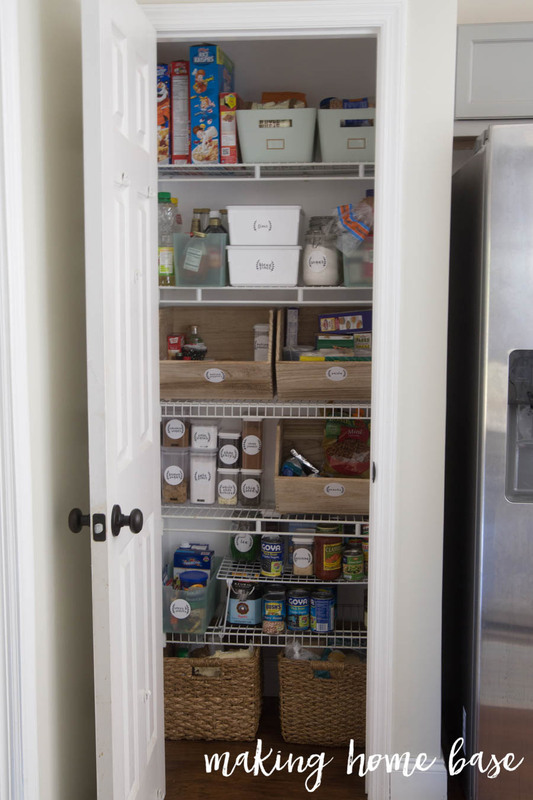 One tip is to add the shelving unit that fits on the door. 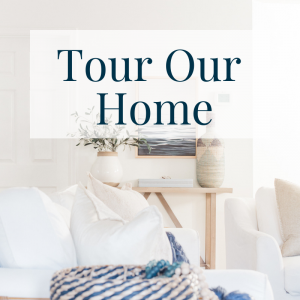 We added that in our last house both for the pantry and the linen closet and it is amazing how much storage you have with a unit like that. I put two on the wall in my new home walk in pantry. I don’t think I could live without them. You can see the unit I’m taking about here. 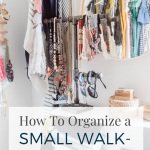 – – -https://www.astrollthrulife.net/2015/08/cleaning-organizing-pantry.html. I buy mine from Walmart and they are really inexpensive. About $35. Thanks for that recommendation, Marty! I’m going to check it out! I’m really quite stunned how much of a difference pulling them out has made. This turned out SO good! Amen to suiting your family. There are so many beautifully organized spaces to stare at on the internet, but if it’s not functional, what’s the point? !